The Thurgoona Grapevine is a Thurgoona Community Centre project which is produced and edited by the TCC Coordinator. It has become a voice for the community with regular articles from many contributors. All Thurgoona community organisations are welcome to send in information and photos to be included in each quarterly edition. Community services are also welcome to include information about what they offer. If you would like to be a regular contributor, please send your details to [email protected] We will send you reminders and publication cut-off dates. All are welcome to contribute in some way. You might like to include a story about your hobby, pets, interests or life experiences. Please give Sherylyne a ring about your ideas on 6043 1588. 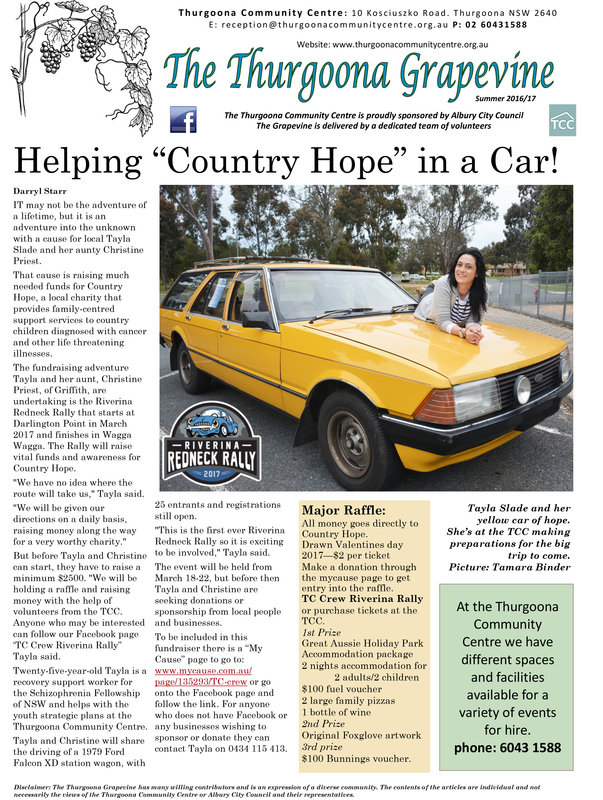 The newsletter is hand delivered to Thurgoona residences by a team of dedicated volunteers. Many provide invaluable support for the production of the newsletter. There are 4,000 copies printed for each edition. This is possible because of the income earned through advertising space in the newsletter making it a valuable social enterprise.